NASA scheduled SpaceX Dragon Spacecraft departure from International Space station for 11th May, 2016 from resupply mission CRS-8. Launched 8th April on a SpaceX Falcon 9 rocket, Dragon is the only space station resupply spacecraft able to return to Earth undamaged. The Dragon launched from Cape Canaveral Air Force Station (CCAFS) for the company’s 8th NASA-contracted commercial resupply mission, was docked to International space station on 09th April 2016. The Cargo spacecraft delivered about 7,000 pounds of science & research investigations including inflammable BEAM (Bigelow Expandable Activity module) on April 10th. 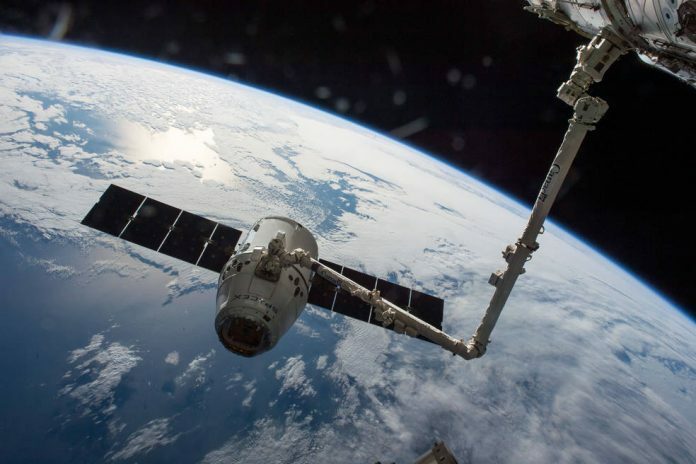 NASA officially announced the return date of the Dragon on 5th May 2016 and unveiled that cargo spacecraft will be undocked on 11th May 2016 from Harmony Module using Canadarm2 robotic arm, which will be operated at NASA’s Johnson Space Center in Houston. The skilled robotics controllers will carefully guide the Dragon into place and Tim Peake of ESA (European Space Agency), Expedition 47 robotic arm operator will execute the command for release at 9:18 a.m.
Before being commanded to begin deorbit burn, Dragon at 2 p.m will fire its thrusters three times to move to a safe zone from the space station. The pressurized section of the spacecraft, referred often as capsule will splash down in the Pacific Ocean about 2:55 p.m. NASA Television will broadcast the departure of Dragon from 9:00 a.m, EDT but the deorbit burn and the splash down will not be on covered. NASA’s recovery team which reach Dragon in three boats will retrieve the capsule from the Pacific Ocean and about 3,700 pounds of payload will be carried back to laboratories for further study. Dragon cargo includes samples from human research, biology and biotechnology studies, physical science investigations and education activities sponsored by the NASA experiments and Center for the Advancement of Science in Space (CASIS). The spacecraft also will return the final batch of human research samples from the one-year crew mission. In case of unfavourable weather conditions in the Pacific, the backup departure and splashdown date is anticipated to Saturday i.e., 14th May 2016. On picture above: Dragon CRS-8 seen from Cupola module where Canadarm2 is operated.